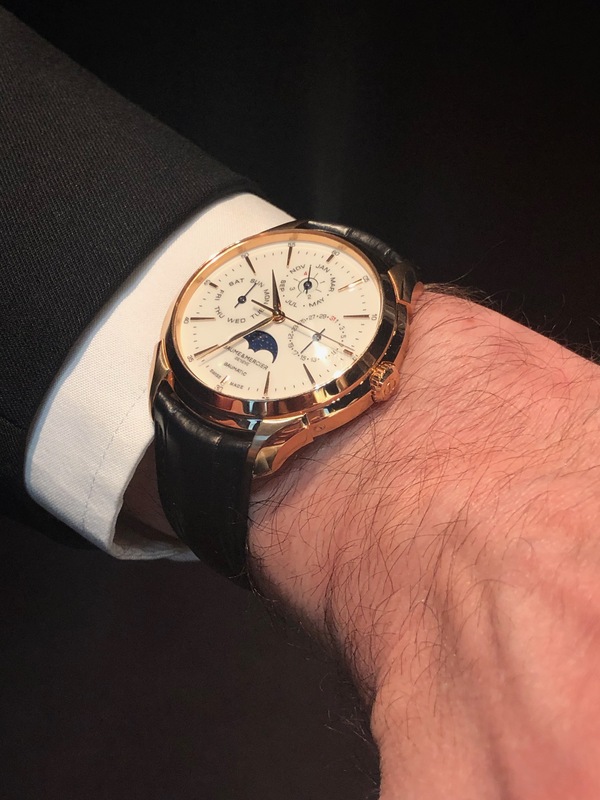 SIHH 2018: Baume & Mercier Clifton Baumatic Perpetual Calendar watch. It was just last year that Baume & Mercier made huge strides in the watch world with the unveiling of the Baumatic movement and subsequent watches. 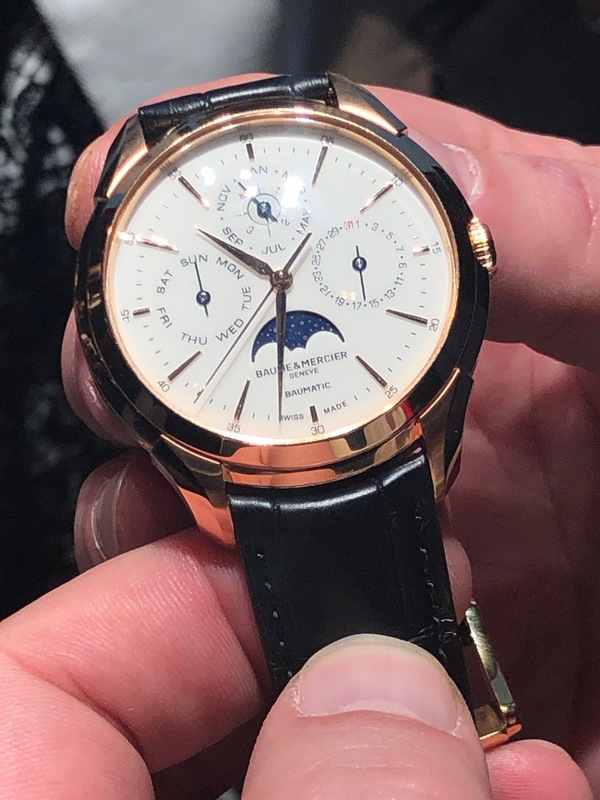 Now, for SIHH 2019, the brand releases the Clifton Baumatic Perpetual Calendar that, for the first time, combines the Baumatic movement with a perpetual calendar module. The Baumatic self-winding movement is highly reliable thanks to the combination of its silicon hairspring and a high-performance escapement. In addition to five days power reserve, the Clifton Baumatic Perpetual Calendar offers a precision of –4/+6 seconds per day throughout its power reserve period. It can also resist magnetic fields of up to 1,500 gauss and will require no maintenance for at least five years. 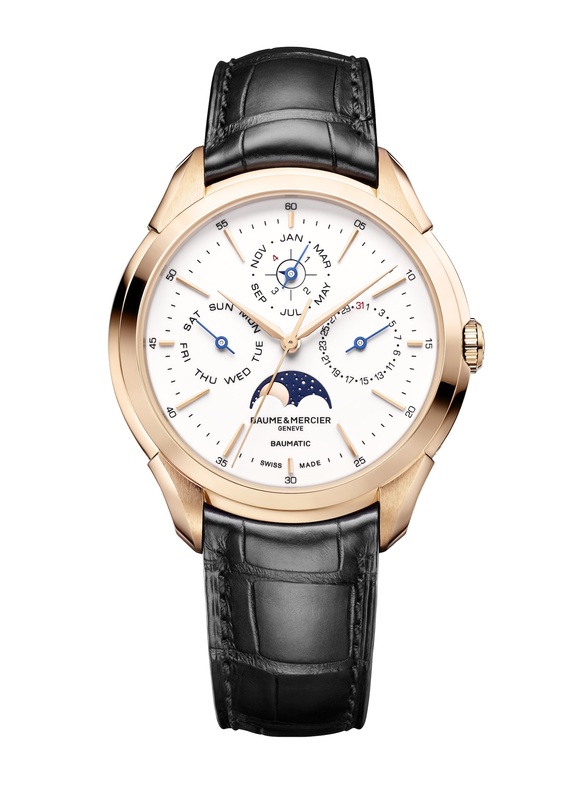 The Clifton Baumatic Perpetual Calendar requires no date correction before March 1st, 2100, a non-leap year. The 42mm 18-karat 5N rose gold watch features a white porcelain finish on its dial, faceted and riveted hour markers and gold-tone hour, minute and seconds hands. The day of the week is indicated at 9:00, the month and leap year cycle are found at 12:00, and the dates is at 3:00.The moon phase indication appears at 6:00 for a harmonious look. The watch is fitted with an antiglare domed sapphire crystal. 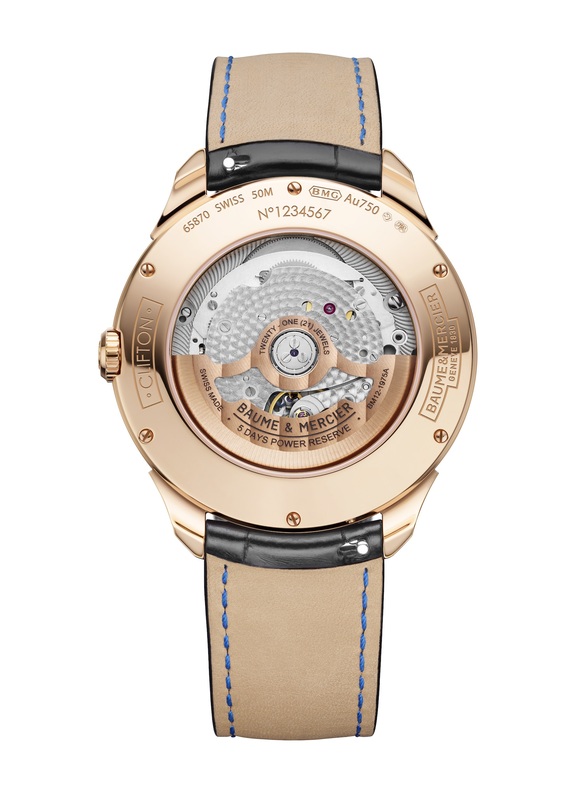 Additionally, the caseback is fitted with a sapphire crystal to allow for viewing of the movement. The openworked, gold-plated oscillating weight is adorned with a decoration combining Côtes de Genève with snailing. The watch is fitted with an interchangeable strap.This Clifton Baumatic Perpetual Calendar joins several other important complications the brand has released over the past few years, including the Clifton 1830 Manual (2013), the Clifton 1892 Tourbillon Volant (2014), the Clifton Réserve de Marche 8 jours “185 years” (2015) and the Clifton Pocket Watch 5 minutes Repeater “185 years” (2015).